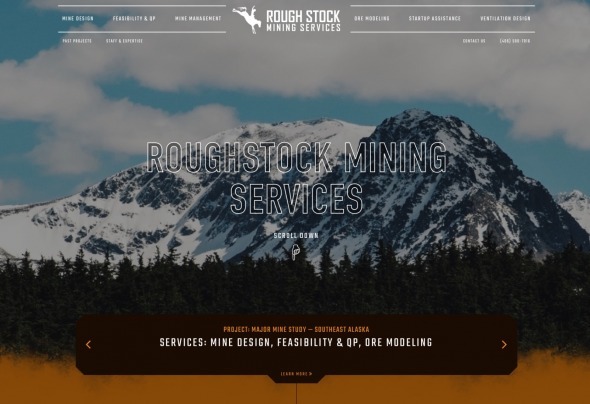 We are pleased to announce the launch of a new website for Roughstock Mining Services! Details Unique Services — The new site features Roughstock’s expertise in mine management, startup assistance, mine design, ventilation design, feasibility and QP reporting and ore modeling. Each service area is thoroughly outlined with imagery and notable datapoints as well as featured projects. Potential clients can easily search for the services they need and find Roughstock prominently visible in search results. Past Project Portfolio — Roughstock has worked on mines across the America’s from Alaska to Brazil. The new website highlights the wide variety of mining projects that have been completed and the expertise used in these projects in a portfolio to establish Roughstock’s credibility with varying ore bodies in different regions. Each portfolio item includes the location, mine type, service provided, and software used for that project. Experience & Expertise — Due to their long history in the mining industry and diverse background of skilled workers, we are featuring Roughstock’s experience and expertise with detailed staff bios and an expose of their reputation in the industry. Having been in business since 2012, and with crew members each holding 20-30 years of experience, Roughstock is well positioned to serve those in need of complex mine design and ventilation services, startup assistance and reporting. This new site will better illustrate everything the company has to offer and allow clients to browse their services and projects. We invite you to browse Roughstock Mining’s new website at roughtstockmining.com!